WASHINGTON — City and county officials from across California who oppose the state’s sanctuary law sat down with President Donald Trump on May 16 to voice their objections to the law, and they got a pep talk from the president who slammed the state for failing to crack down on illegal immigration. The officials, including Orange County Supervisor Michelle Steel and officials from Laguna Niguel, San Juan Capistrano and Los Alamitos, hailed from counties and cities that have taken stances against the law, some by joining or filing briefs in support of a Trump Administration lawsuit challenging it. “Each of you has bravely resisted California’s deadly and unconstitutional sanctuary state laws,” Trump told the group gathered in Washington, D.C. “You’ve gone through a lot, too, although it’s becoming quite popular what you’re doing. A law that forces the release of illegal immigrant criminals, drug dealers, gang members and violent predators into your communities. Trump did not give specifics about the case. 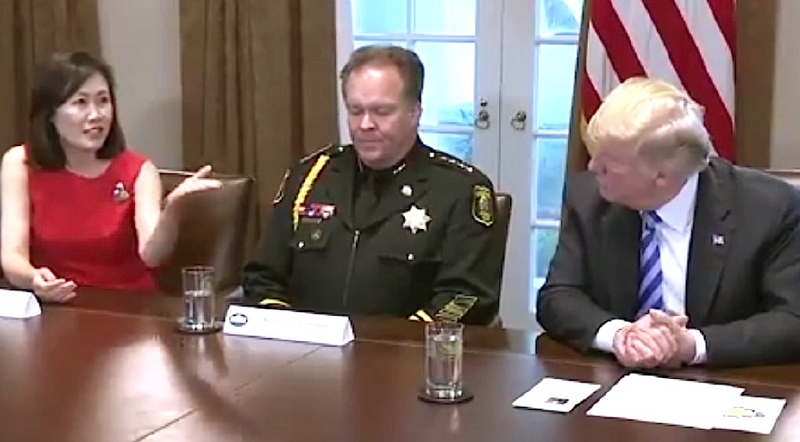 The president then listened as each of the officials attending the meeting praised the work his administration is doing to address illegal immigration and discussed their municipalities’ efforts to challenge the sanctuary state law. “The fact that we have this unsecured border is putting all of us at risk because we know that terrorists are coming in,” San Juan Capistrano City Councilmember Pam Patterson said. Los Alamitos Mayor Troy Edgar, whose city’s move to officially oppose the law sparked other conservative-leaning cities and municipalities to do the same, also hailed Trump’s efforts and went so far as to ask for help fending off a lawsuit by the ACLU. Trump assured Edgar that “we’re with you 100 percent” and said “if it’s at all possible” he would like to help the city fight the lawsuit. Edgar was joined by Los Alamitos Mayor Pro Tem Warren Kusumoto. Los Alamitos in March approved an ordinance claiming an exemption from the sanctuary state law, which limits cooperation between local authorities and federal immigration officials. 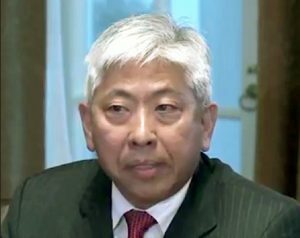 Kusumoto: Mr. President, I’m Warren Kusumoto from the tiny town of Los Alamitos, and we were first and we were boldest. (laughter, applause) We’ve done something that no other city has done. We’ve actually passed an ordinance and exposed our city to a lawsuit, as Mayor Edgar said … There’s a silent majority of patriots out there … They want us to do what we’re doing. Anyone with common sense knows this California Values Act was put in place to protect those that are here breaking the law. The message I got from this whole experience is the citizens of our state and our city feel like they have less rights than the entitled illegal aliens, and the entitled attitude is the thing that makes me really unhappy. They feel that they’re entitled to something that we [citizens]don’t even get. So please, sir, we need your help. We appreciate your leadership. Trump: By the way, you gave us great leadership too. Don’t kid yourself. You did a great job. Kusumoto: Thank you, sir. But the double-speak of the politicians of the state of California … They commandeered our police force by tying their hands. So that’s the double-speak that comes from the bullies there [in Sacramento], so we just poked the bully. And I think … we’re closest to the people, we know what the people want, and we’ve gone forward with that boldly. I’ve asked other cities to step up and at least consider the matter, listen to their constituents, and they’ll know what they’re supposed to do. Thank you, sir. Steel: Thank you for inviting us. I just want to say as a first-generation Korean American who went through the legal process to come here, I really appreciate the release of three Korean Americans from North Korea. Trump: Thank you. We’re very happy about that. Steel: At the same time, for SB 54, because of the city of Los Alamitos, they have 11,700 people living there and they had a gutsy move, and then Orange County led. As of now, nine counties out of 58 in California, they passed ordinances or resolutions to go anti-sanctuary state. And then more than 35 cities as of now. I got all these emails, mostly positive. And then a Berkeley study came out where 57 percent are against us, for sanctuary state, and 41 percent against sanctuary state. I don’t think that polling is really right because whatever we get, we get mostly positive ones except that person who called me [racist]. Trump: You’ve done a great job, Michelle, we appreciate it.